Acts 17: What Is the Argument from Reason? What Is the Argument from Reason? The Argument from Reason is a collection of arguments that attempt to move from some fact about human reason to some claim about worldviews. Since human beings use our reasoning ability regularly, it is all too easy to ignore (a) the metaphysical implications of reliable cognitive faculties, and (b) the skeptical implications of an atheistic worldview. Consider the following (admittedly oversimplified) argument. Human beings have the ability to reason about ourselves, the world, and God. We treat our reasoning ability as generally reliable. If Naturalism is true, our beliefs must be the result of physical processes in our brain. But if our beliefs (both true and false beliefs) are the result of physical processes, they are governed by laws of nature, which are incapable of reasoning or of preferring true beliefs to false beliefs. Hence, on Naturalism, human reasoning ability is not generally reliable (because it is grounded in natural objects, processes, and laws that have no concern for truth). Hence, if I affirm Naturalism, I cast significant doubt on my beliefs, including my belief in Naturalism. 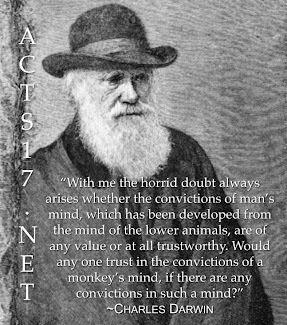 The only way out of this conundrum for naturalists is to claim that, in the Darwinian struggle for survival, reliable cognitive faculties conferred a selection advantage on certain organisms, and that organisms with generally reliable belief-forming faculties had an advantage over organisms with less reliable faculties. But this response fails for a number of reasons. Consider, for instance, another version of the Argument from Reason. Natural selection does not favor truth. It favors traits that help organisms survive and reproduce. False beliefs are often just as effective (or even more effective) than true beliefs. Hence, in the struggle for survival, cognitive faculties that produced false beliefs would have been selected whenever the resulting behavior was beneficial. Hence, if Naturalism is true, human reasoning ability is fundamentally unreliable, for it is the product of a selection process that doesn’t favor truth over falsehood. Apart from defeating Naturalism, the Argument from Reason may also be used to support Mind-Body Dualism (by showing that reason must include something non-physical) and Theism (via a version of the Design Argument). Another good book on the subject is "I don't have enough faith to be an atheist" by Norman Geisler and Frank Turek. I have a new challenge for you. I think the Atheist friends have found a new argument for their believes and they have some convincing evidence. I am not sure If you are aware of this, did you watch the BBC Earth Video about the Koko the TalkingGorilla? Yep they believe that monkeys are just like humans and they are even willing to share some of our human rights with the apes(I am not against animal rights)But if they say I can't eat a cow because cows have some human feelings then I have a problem. Have you done any research on this? I don't have a Phd but I am getting there, It would great if you can help me with this and also the other Christians as well. "False beliefs are often just as effective (or even more effective) than true beliefs." Why do you believe this is the case? Say a man believes he will get a raise because he has been working hard and has demonstrated his value to the company, and this is a true belief. He approaches his boss and gets a raise. Now imagine believes he will get a raise because Mercury is in retrograde and this is favorable for him, and this is false. He approaches his boss and gets a raise. Are these equivalent outcomes? Not quite. See, in the first scenario, the man understands what led to his raise, and is now empowered to seek future raises by continuing his hard work. The second scenario produces a man who mistakenly believes the motion of the planets plays a factor, does not know the role that hard work plays, and will likely end up confused and without a raise if he patiently waits for the next favorable alignment to approach his boss for another raise. I personally can't think of a case in which a true belief is inferior to a false belief, or even as-good. Even though a false belief may lead to a correct action by chance, they aren't generalizable the way true beliefs are. It's much like trying to lie your way out of a predicament. Sure, one lie might work in the short term, but if someone is determined to find the truth, you'll often end up creating a complicated web of lies which ends up exposing a contradiction. Whereas telling the truth will never lead to contradictions.